Polar Pioneers Video Slot Review - Casino Answers! 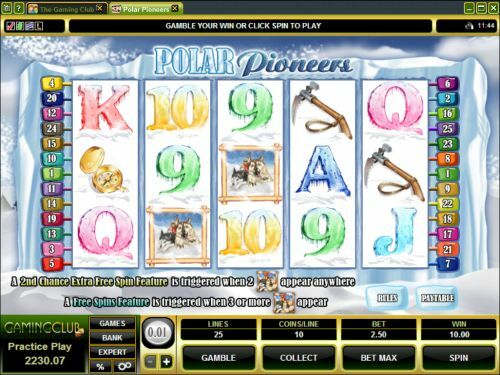 Polar Pioneers is a 5-reel, 25-line video slot developed by Microgaming, featuring a wild symbol, scatter wins, a re-spin feature, a free spins feature and a gamble feature. You can play the Polar Pioneers video slot at Bovada. Polar Pioneers is a penny slot. Coin values on the Polar Pioneers slot machine are $0.01, $0.02, $0.05 and $0.10. You can select up to 25 paylines per spin on the Polar Pioneers slot game. You can bet 1-10 coins per line on the Polar Pioneers casino game. The maximum total bet on the Polar Pioneers slot machine, which is ideal for casual players. To play the Polar Pioneers video slot, select your bet and press the “Spin” button. You can also press the “Bet Max” button to play all 25 lines at 10 coins per line. The top-paying symbol on the Polar Pioneers video slot is the Explorer symbol. If you hit 5 Explorer symbols on a selected payline, you will win the 15,000 coin top jackpot. The Explorer symbol is the wild symbol and will substitute for all symbols except for the Scattered Huskies symbol. Other high paying symbols on the Polar Pioneers slot game include the Ship (2500 coins) and Boots (1000 coins) symbols. The Huskies symbol is the scatter symbol on Polar Pioneers. When two or more Scattered Huskies symbols appear, you will not only get a scatter win of up to 125X your total bet, but you will also trigger the 2nd Chance extra free spin feature or re-spin feature. The reels where the Huskies land on will be held and the remaining reels will be re-spun one time. Payouts will be awarded again. If you hit another Scattered Huskies symbol, you can trigger the free spins feature. Get an extra free spin and win free cash when you trigger this feature at Bovada! When 3 or more Scattered Huskies symbols appear on the reels of Polar Pioneers, you will win 10 free spins at a 2X multiplier. Wins during the free spins feature are doubled. The free spins feature can be re-triggered. The 2nd Chance free spins feature cannot be triggered the free spins feature. Free spins are played at the lines and bet of the trigger game. Free spins feature wins are added to payline and scatter wins. Payouts are made according to the Paytable. Payline wins are multiplied by the bet per line. Scatter wins are multiplied by the total bet. Scatter wins are added to payline wins. All symbols pay left to right except for the Scattered Huskies symbol (which pays any). Highest win only on each selected payline. Coinciding wins on different selected paylines are added. Explorer wild symbol will substitute for all other symbols except for the Scattered Huskies symbol. Polar Pioneers has an autoplay feature with advanced settings. To use the autoplay mode on the Polar Pioneers online slot machine, you must hit the “Expert” button. You can now play 5 or 10 autoplay spins. For advanced settings, hit the “AutoPlay” button and you can now play 5, 10, 25, 50, 100, 250 or 500 autoplay spins and stop autoplay if a win exceeds or equals $100, $500, $1000, $5000 or $9999. Autoplay will stop on any feature contained in the game. 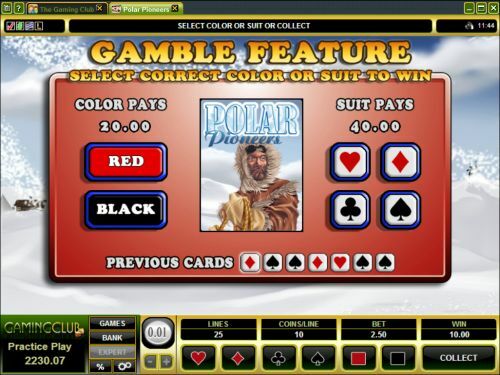 You can stop autoplay at any time on the Polar Pioneers slot game. The Polar Pioneers video slot has a 15,000X top payout, a gamble feature and not one, but two free spins features. It also has some nice presentation, which can make the difference between a decent and good video slot. You can play this video slot when you sign up and make a deposit at Bovada. Can USA players play the Polar Pioneers slot machine for real money? No, players from the United States cannot play the Polar Pioneers video slot for real money at this time. Instead, you can play the Winter Wonderland video slot for real money. Where can I read more winter or arctic themed video slot reviews? For more arctic-themed video slot reviews, you can read our list of winter slots for all of the cold-weather and Christmas slots you can find.